For more than a year House Republicans on various committees have been trying to obtain all documents pertaining to the Hillary Clinton email investigation conducted by the FBI and Justice Department, but they’ve been getting stonewalled by Deputy Attorney General Rod Rosenstein and, at times, FBI Director Christopher Wray. Rosenstein has been the biggest obstacle and the stonewalling ringleader, by far, and on Thursday members of the House Judiciary Committee blasted him and, to a lesser extent Wray, for continuing to resist their very legitimate requests for unredacted documents. The tense Q & A comes the same day the House Republicans passed a resolution demanding the DOJ comply with requests to turn over classified Trump-Russia docs or face impeachment or a contempt charge. 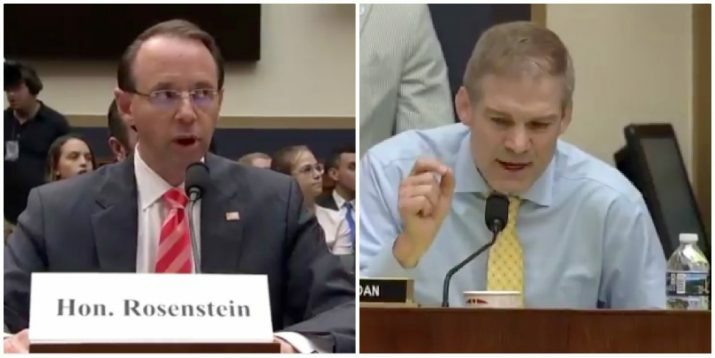 Jordan slammed Rosenstein and reminded him the House was voting to pass a resolution giving him “seven days to get his act together.” Rosenstein looked visibly uncomfortable at the hearing. The deputy AG tried to defend himself and his agency for its lack of complete transparency, claiming that he had personnel “working day and night” to comply with Congress’ document requests. “That’s not accurate,” Rosenstein replied at one point. As noted by The Gateway Pundit, Gowdy torched both officials but especially Rosenstein because he appointed Mueller (and he may even have done so without any legal basis because no crimes were alleged to have been committed by POTUS Trump or anyone on his campaign team). “Whatever you’ve got, finish it the hell up, because this country is being torn apart,” he said. Read more stories about the conservatives in Congress at Conservative.news.